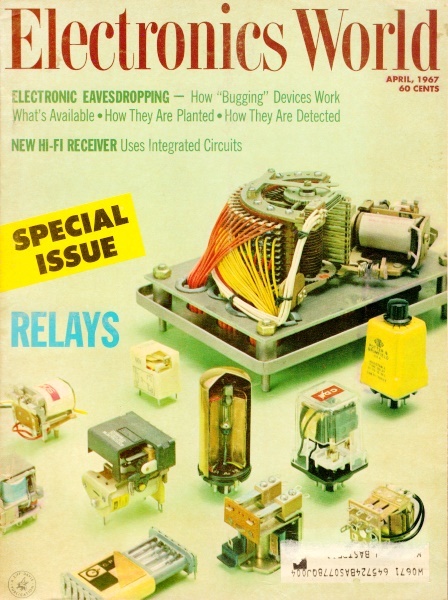 So, for those who still appreciate a good resistor selection nomograph, here is one from the April 1967 edition of Electronics World. Here's a challenge for you recent college grads that are scoffing at the guys who are right now having a grandkid print out a copy of the nomograph for them: What is the resistor color code number associated with the color of the nomograph? Resistance values and power dissipations may be readily determined by the use of a straightedge. For the man involved in the electronics field, it frequently becomes necessary to determine the value of a resistor and wattage. The nomogram below was designed to give the resistor value and its wattage simply by placing a straightedge from the potential scale to the proper current scale and reading the answer on the Resistor Value Scale or the Wattage Scale. 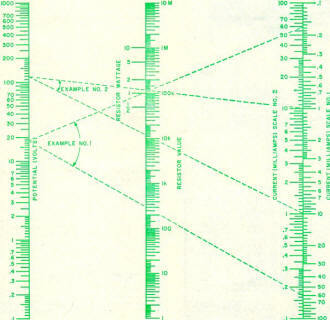 It will be noted that there are two current scales on the nomogram. They are listed as Current (Milliamps) Scale No. 1 and Current (Milliamps) Scale No.2. Scale No.1 is used only when determining the value of the resistor. Scale No. 2 is used for determining the wattage of the resistor. 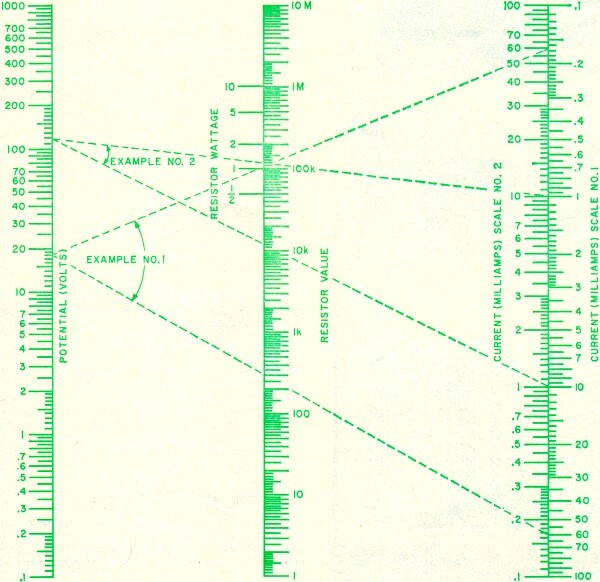 Following are two examples illustrating the use of the nomogram. Example No.1: It is found that a cathode bias resistor is burned out and no schematic is available. Total current of the tube - rated at 60 mA. Grid bias is -18 volts. Determine the value, in ohms, and wattage of the resistor. Solution: Extend a straight line from 18 on the Potential Scale to 60 on the Current Sca1e No. 1. Read the value of the resistor at the intersection of this line with the Resistor Value Scale as 300 ohms. To determine the wattage, extend another line from 18 on the Potential Scale to 60 on the Current Scale No. 2. At the intersection of this line with the wattage scale, read the answer as slightly over 1 watt. Since the value is higher than 1, use the next higher value, namely 2 watts. Example No.2: Determine the value, in ohms, and wattage of a resistor under the following conditions: Voltage is measured at 117 volts, current at 10 mA. Solution: Extend a straight line from 117 on the Potential Scale to 10 on the Current Scale No. 1. At the intersection of this line with the Resistor Value Scale read the value as 11.7 kohms. To determine the wattage, extend another line from 117 on the Potential Scale to 10 on the Current Scale No.2. At the intersection of this line with the Resistor Wattage Scale, read the answer as just over 1 watt. Assigning the next highest value, the answer then becomes 2 watts.